New program in Milwaukee trains chaplains to provide support alongside law enforcement following tragedy. 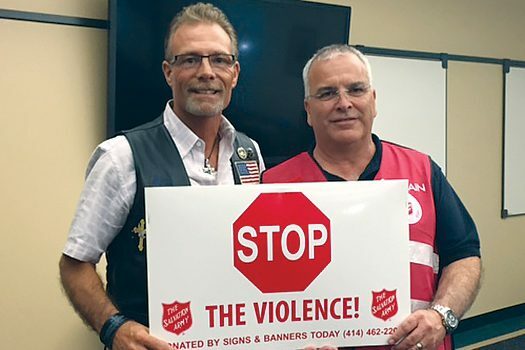 After months of planning and weeks of recruiting and intensive training, The Salvation Army of Wisconsin and Upper Michigan presented its first complete team of chaplains with one goal: to care for those affected by violent crime in Milwaukee. The grassroots initiative, officially named The Salvation Army Chaplaincy Program (TSACP), aims to help victims, family, friends and witnesses of crimes cope with trauma while allowing Milwaukee police officers to investigate crime scenes and maintain civilian safety. So when a violent crime occurs in Milwaukee—where the violent crime rate is over triple the national average—the chaplains may be called out at any time of the day or night. They administer emotional, spiritual and psychological support to those involved and facilitate an environment where police officers can complete their work. Chaplains can also “adopt-a-block” and become a peaceful presence within the districts they serve. The idea transpired after a discussion between District Seven Police Officer Jutuki Jackson and The Salvation Army’s Communications Director, Faithe Colas. With the help of the division’s Director of Development, Stan Kelley, and Service Extension Director Tom Thuecks, the program took off. On May 13, Major Dan Jennings, Wisconsin and Upper Michigan divisional commander, the Milwaukee Police Department (MPD), Chief of Police Ed Flynn and local nonprofit Faith Builders announced a partnership. “We need our entire city to feel safe and feel whole,” Colas said, noting that TSACP is the first program of its kind by The Salvation Army. haplains signed up for mandatory training—32 hours of police academy, 14 hours of spiritual and psychological first aid, 14 hours of grief following trauma training, and some online disaster training. On May 29, 58 candidates graduated. A few weeks later, on the night of June 16, the official chaplains—57 people of various religious backgrounds, ages, and cultures—met at Divisional Headquarters to receive their uniforms. Though simple, the burgundy vests symbolized something greater. As the chaplains pulled the vests from cardboard boxes, shook them from their starchy folded form, and tried them on, they became emblems of the love and support that these volunteers would soon show their community. Chaplains also received yard signs sporting the phrase “Stop the violence!” After hearing news of the chaplaincy program, owners of Sign & Banners Today, Mary and Neal Eisendrath, donated 250 signs for chaplains to place in their yards or at the sites of vigils. According to Neal Eisendrath, it’s not something the company always does, but the cause spoke to them. The meeting that evening began as a team building effort. Each of the chaplains received a district assignment, so they would know the area of Milwaukee they would be serving and have an opportunity to get to know that community. Between five and six chaplains were assigned to one of seven police districts. Veloris Brooks was assigned to District Four. The lifelong Milwaukee resident is eager to begin working as a chaplain, but she doesn’t take the task lightly. Officer Greg Hunter also understands the program’s gravity. He said the chaplains’ main goal is to help victims while understanding the police department’s own objective: safety. The program isn’t just about safety, though. Chaplains will stick beside their clients for as long as needed. According to Thuecks, The Salvation Army can also offer “wraparound services,” such as rent or meal assistance, even after the dust of a violent incident has settled. “A lot of the families that experience tragedy such as this also have other needs,” Colas said. Brooks expects the community to embrace the chaplains, even if they may initially be reluctant.